Much to the surprise of nobody who’s ever heard me try and pronounce the word “drawer,” I grew up on Long Island. It was a nice place to be a kid and while I confess that I don’t have a very clear recollection of the details, I have good reason to believe that I had a happy childhood. Spring, in particular, brought with it a number of things worth smiling about. Bike riding, tree climbing, and stickball in the street, to name just a few. None of these things, however, compared in wonderfulness to the biggest springtime thrill of all: The annual return of the Ice Cream Man. It never occurred to us to wonder where he went during the winter (thinking back now about the man himself, I’m guessing either prison or Congress), but it didn’t matter. All we knew was that come mid-May, daily afternoon ice cream was back on the menu. Back then, the Ice Cream Man sold nothing but ice cream. His truck was literally just a big freezer on wheels. First, he’s not always a man. Second, he traded the jingly bells for a blaring, circus-afied version of the theme from The Sting (for his own peace of mind, I can only hope that Scott Joplin is still dead). And finally, he sells much more than just ice cream. There’s gum. And candy. And soda. And Slim Jims. It’s like a mobile 7-Eleven, minus the disgusting bathroom (I’m hoping). Is it an entirely accurate moniker? Clearly not. What it is, however, is a more or less, if you had to pick one thing, oversimplified, easy to say, effortless to remember, description of reality. Now let’s talk about you. Are you The Ice Cream Man or are you a 7-Eleven? In other words, when somebody asks you about your work, do you launch into a rambling blah blah that differs from day to day and covers the entire scope of what you have done and can do? Or (I’m hoping), do you provide a deliberately oversimplified few words that sacrifice accuracy for unforgettableness? A broad scope is hard to remember. The contents of a 7-Eleven are so unremarkable and so random that the store has decided that its most distinguishing feature – and therefore the one for which it should be named – is its hours of operation. The Ice Cream Man, on the other hand, owns “ice cream” in the mind of every 10-year-old on the block. Kids (and some adults) literally chase him down the street. A narrow description doesn’t preclude selling other things. The modern ice cream man sells all kinds of other products. But we still call him The Ice Cream Man. Similarly, just because you narrowly describe your focus when asked, it doesn’t mean you can’t sell other things. I tell people, “I specialize in email newsletters,” even though what I actually do is much more broad. Nobody but you is paying attention to you. We’re all busy and we’re all preoccupied with our own stuff. With a few notable exceptions (hi mom), when it comes to being remembered (which leads to being referred which leads to being hired) you have but two options: simple or nothing. Here’s the bottom line. I know you’ve done a lot in your professional life and I know that you’re capable of that and much more. But if your description of your work doesn’t fit easily on the side of a truck, the odds of my understanding it – much less remembering it – are exceedingly low. Remember, if the way you describe the work you do doesn’t feel like a painful oversimplification, you’re not doing it right. Did you have an ice cream man when you were growing up? Give examples; show your work. Have you ever been a member of Congress and/or in prison? How do you simply describe the work you do? 3. I help single women make sense of their money and their taxes. 1. We did have an ice cream man. I lived in a quiet street with a lot of kids. He could park in the middle and ring to his hearts content. I’ve never bought from the current man, that music is just too annoying. 2. No way. Not sure which is worse. 3. I work a day job (yes the horror) and am shopping for a new job. Find myself having to package myself. Turns out I’m an Accounting Manager with a proven ability to streamline month-end processes. Tracey, Being clear about a specialty inside a company is important too. I think your focus on one aspect of accounting is very clear. In our small central Illinois farm town the Ice Cream Man was called the Popsicle Boy. Frozen treats were peddled (pun intended) in a crossbreed of bicycle meets dry-ice washtub. Just one speed… grueling. Daily delivery each summer was signaled by clanging bells on the handlebar. Or noticing the neighborhood dog pack positioning themselves for an upcoming attack. Becoming Popsicle Boy was the ultimate rank in juvenile society. Question 2: Not saying which, but only for a short time. Simply describe the work I do… retail parking lot filler. 1. Wow, it sounds like you grew up on the cover of the Saturday Evening Post! 2. Assuming there’s a difference, of course. 3. What I like about your phrase is that it’s focused on solving the problem your clients have, as opposed to what you do or how you do it. We help Small Businesses Get Paid – In Full and On time!_! 1. Ours sat at the fork in the road on the way home from school. You know what happens when you give people choices. 2. Volunteered in one, never been the other. 3. I teach holistic practitioners how to talk to people so they become clients. Actually, I had no idea either was a word! I considered Wyneth, as in Ms. Paltrow. And yes, bonus points to you all around! “…sacrifice accuracy for unforgettableness” Beautiful! 1. Yes and you want to hate the loud music and announcements but you love that you know he’s coming. We’re a volleyball club and people are usually very perplexed when I say we change lives but we do. Kids get scholarships for college, adults meet their future spouse, etc., etc. Interesting about changing lives. Hard to beat that! 3. I help people who experience food and eating as a place of struggle…and who want a holistic, primal, mindful approach to looking and feeling better. Glad to hear about #2. And yes, I think your #3 is a too involved. One of the things we’ll be covering in the word of mouth marketing webinar on Wednesday (shameless promotion here: http://goo.gl/ZDZRWC) is that it needs to be easily memorable – and repeatable – by someone other than you, since you’re typically not there when people are considering options. 1. Yes. He sold dream-sickles so cold one got stuck to a kid’s tongue. The parents didn’t sue. 2. Yes. Once. As a wedding celebrant. The bride glowed. The groom cried. 3. I am a plant whisperer. 1. Good news. It would be tough to go through life with one of those stuck to your tongue. 2. In congress, I assume? 1. Yeah, but only on the weekends… I think he was the local plumber who cleared a space in his van to store an ice box. Even today when I eat ice cream I get a sensation of grease and solder. BTW there was no recorded music, he’d hang an arm out the driver’s door window and ring a bell. 3. I’m a corporate aspirin. I ease the pain of poor performance. Skipping the responses to the questions this go ’round, but I’d still like bonus points for noticing that you switched out your previously oversimplified “I specialize” statement at the bottom of your newsletter to underscore your message … and to see if anyone out there is really paying attention. If I ever get a lawn, I’ll let you mow it. Observant R U, Michael! 1,000 bonus points and a free lawn mow! 1. Yes we had an Ice Cream Man, and his name was Joe and he only rang a simple set of bells as he drove through the neighborhood. When he stopped, he often listed all of the ice cream offerings in rhyme – which was possible I guess because he wasn’t a rolling 7-11… I still miss him. 2. No, The idea of going to jail or congress terrifies me and keeps me on the straight and narrow. Your ice cream man sounds much more on the ball than mine was! And I like the first part of your #3. I think adding the “but I also…” part muddies the message a bit. What do you think? 1. Yes, I had an ice cream man growing up. The Pavlovian in me still drools when I hear ice cream truck music. 3. I troubleshoot comment forms. Drooling is good. As is fixing comment forms, so thanks for your assistance! 1. 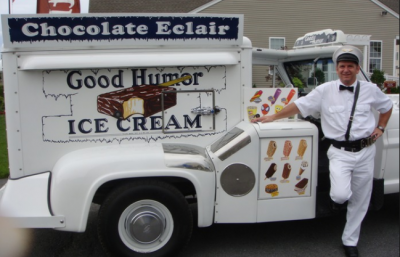 Amazingly enough, our ice cream man growing up in Indianapolis was THE MR SoftEE! so good, and none of those pre-wrapped items out of cardboard boxes for us! PS, we also had David Letterman as the bag boy at the local grocery, although we didn’t know him then…. 2. In prison once, for an educational program working for the American Cancer Society….swore I would never go back as the pre-visit “searching” was humiliating. Now I let the TSA do it, even time I travel. 3. Face and Body Painter for corporate and private special events. No, really!! !